Three Destinations. One Great Story! 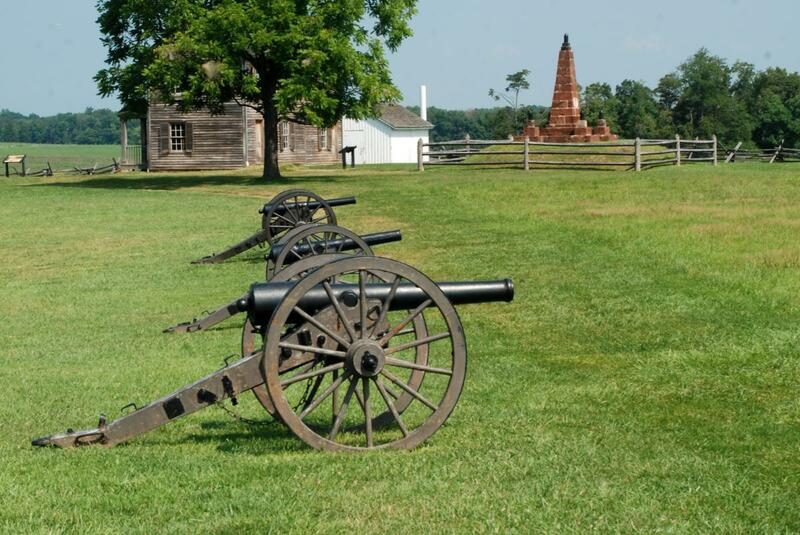 Prince William County, Virginia Start the afternoon with a Civil War guide dressed in his military uniform lead you to Manassas National Battlefield Park “Where the Southern Victories Tested the Northern Resolve”. This was the first major land battle of the United States’ Civil War, two armies clashed for the first time, heavy fighting swept away any notion of a quick war. Afterward, visit a Civil War hospital at the Ben Lomond Historic Site. Soldiers were taken here after the Battle of First Manassas to care for their wounds and left their signatures on the walls to prove it. Learn about 19th-century medicine used to care for the injured soldiers. Afterward, visit Effingham Manor Winery to sample their signature wine “King’s Ransom” or enjoying craft beer, craft food and live local music at 2 Silos Brewing Company, a place to bring family and friends together. Enjoy your dinner with the owners of MurLarkey Distilling. All from the New England area, the owners will treat you as a member of their family where you’ll enjoy a relaxing and entertaining meal in the distillery or tasting room. Try one of their signature cocktails during your visit, made with their gourmet gin, vodka, or whiskey. Prince William County, Virginia to Norfolk, Virginia– Start your morning with a visit Quantico National Cemetery, where our nation’s veterans are remembered. Have the honor of helping the Missing In America Project, an organization that aims to find, identify and inter unclaimed remains of fallen veterans. Experience a once-in-a-lifetime opportunity by participating in placing flags at the graves of these previously forgotten heroes. Travel down the street to the National Museum of the Marine Corps, a lasting tribute to U.S. Marines--past, present, and future. Have lunch in the Tun Tavern, styled after the original tavern where the Marine Corps was founded in 1775. Then it is off to Norfolk to experience naval history, city life, entertainment and great cuisine and spirits. With over 144 miles of waterfront Norfolk, Virginia is in part of Coastal Virginia where most attractions, shopping and restaurants are walking distance within the downtown area. Come board the Spirit of Norfolk, which offers panoramic views of Norfolk and the Navy’s Atlantic Fleet while cruising on the Elizabeth River. The Spirit of Norfolk offers dinner cruises that feature an all-you-can-eat buffet and entertainment. Norfolk, Virginia– The journey beings with a guided bus tour of the world’s largest naval installation, Naval Station Norfolk. Then experience 5,000 years of art history at the Chrysler Museum of Art, home to Walter Chrysler Jr.’s world-class collection of more than 30,000 pieces of art. For lunch sit along the Norfolk waterfront skyline with local music and cuisine at the Waterside District. Then science has never been so fun and exciting at Nauticus, a museum and technology center exploring the power of the sea. Then step aboard the Battleship Wisconsin, the largest and last battleship ever built by the U.S. Navy. After a long day of touring it is time to relax and sip wine made with Virginia grapes at Virginia’s first urban winery at the Mermaid Winery. End the night with a fabulous dinner in the historic Norfolk neighborhood, Historic Ghent. Visit locally owned restaurants and sample house specialties while listening to the staff discuss the culinary creations and history of their restaurant and food. Not time for bed quite yet? Then head over to hear local and nationally known bands in downtown Norfolk on Granby Street. Granby Street is home to more than 30 locally owned restaurants and bars, it is hot spot for great nightlife in till the wee hours of the morning. Norfolk, Virginia to Outer Banks, North Carolina– After touring the heart of the Virginia waterfront, it’s time to hit the road for the final destination on your tour. A 130-mile stretch of barrier islands just off the coast of North Carolina, the “OBX” as it’s known by fans, is a favorite summer vacation spot for families and couples, with mild seasonal temperatures year round. The spring and fall seasons are legendary for enjoying the destination at a slow pace, and our winters have inspired among others, the Wright Brothers. Start your OBX journey with an Air Tour of the Outer Banks! Take off from where flight began at the Wright Brothers National Memorial. Get a bird’s eye view of our islands as you fly down to Cape Point on Hatteras Island and actually see where the Labrador Current and Gulf Stream converge. After the air tour, learn why Orville and Wilbur Wright chose Kitty Hawk to launch their heavier than air machine on our shores. Cap off your day by enjoying the many diverse menus from over 100 local restaurants on the OBX found nowhere else, including regionally and locally harvested seafood, meats and vegetables, craft brews and native wines! Outer Banks, North Carolina– Start out the day by cruzin’ the Outer Banks Scenic Byway. The only road to thread the entire OBX is two-lane NC 12, a National Scenic Byway. Recognized for its scenic beauty, historic maritime landmark, NC 12 is home to one of the largest tracts of undeveloped beach, the Cape Hatteras National Seashore, 70 miles of unspoiled beaches covering 30,000 acres. America’s first seashore is free and has many access points to kick off your day on the beach. Rent a paddleboard or kayak the waves at the famous S-Turns or take a lesson in kiteboarding and learn to harness the wind across the open water of the Pamlico Sound. After your day at the beach, visit the tallest brick beacon on the American coast, Cape Hatteras Lighthouse, standing at 208 feet high.